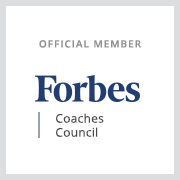 SEATTLE (April 2, 2019) — The Washington Athletic Club (WAC) announces a partnership with Teri Citterman, member of Forbes National Coaches Council and author of From the CEO’s Perspective. This partnership establishes the WAC as the home of Ms. Citterman’s successful CEO forum series and will also include Executive Performance coaching programs held at the WAC, Executive Book Club events, socials and continuing education. In the first of several tailored events created by this partnership that are available to both members and non-members, the WAC will host “From the CEO’s Perspective” speakers’ forum on Thursday, May 9, 2019. 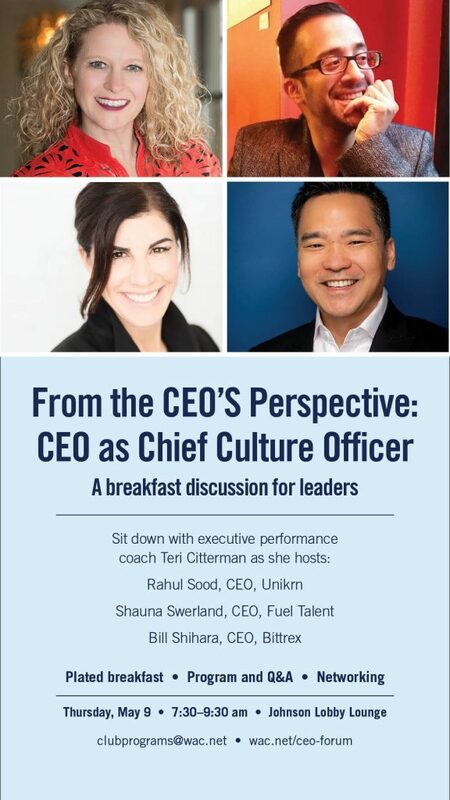 The program features panelists Rahul Sood, CEO, Unikrn; Bill Shihara, CEO, Bittrex, and Shauna Swerland, CEO, Fuel Talent; who will share their perspectives on the “CEO as Chief Culture Officer” — leadership, recruiting, and talent retention — and how company culture improves all three. Register Here. The partnership will add dimension and support to the WAC’s wellness mission beyond the traditional focus of fitness, mindfulness and social connection, to embrace the concept that comprehensive wellness should consider the idea of reaching for one’s full leadership potential and achieving the professional and personal satisfaction that comes from contributing and sharing at an elevated level. “What I’ve learned from the many CEOs I’ve coached, is that prioritizing health, increasing self-awareness and defining a clear leadership purpose is a winning strategy for realizing your fullest leadership potential,” said Teri Citterman. “What excites me most about our partnership is the opportunity to help people who have already formed healthy habits increase their leadership performance. Register at wac.net ($50 for WAC Members and $60 non-WAC Members) for the May 9th event, which includes a plated breakfast and networking opportunities. A designated Seattle Historical Landmark located in the heart of downtown Seattle since 1930, the Washington Athletic Club (WAC) is dedicated to continuously improving and enriching the lives of its members. As the nation’s premier city athletic club and hospitality organization, the WAC offers extensive state-of-the-art fitness facilities, along with lodging, dining, banquet, day spa and wellness services. The Washington Athletic Club is located at 1325 Sixth Avenue (at Union Street), Seattle, WA 98101. For more information, please visit www.wac.net or call 206-622-7900.